Everyone easily recognizes this pretty kitty, right? I came across this order in an unusual way, actually. A fellow cookie friend of mine, The Cookie Countess, was contacted with a request for these cookies. Her schedule was too tightly-packed, however, so I stepped in to help out. These cookies were a quick, easy way I could help out a friend. 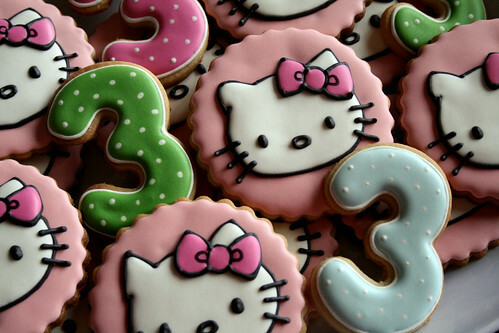 The cookies were to be part of a spread put on in a party covered by Embellish It! Events in Boston. 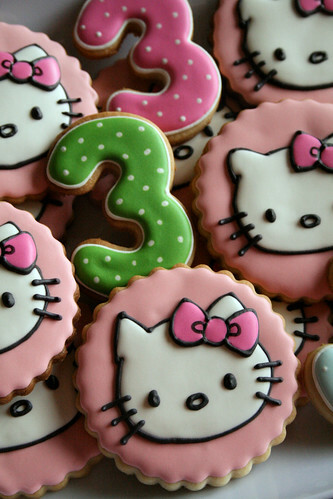 Dominica was so easy to work with, and she requested ’3′-shaped cookies in lime green, pink, and light blue as well. Additionally, they asked for a nice pink bow for Hello Kitty. I decided to go one step further and draw the character on a pale pink background, too. It was my pleasure to help out my friend Hillary, as well as work with Dominica and her clients. 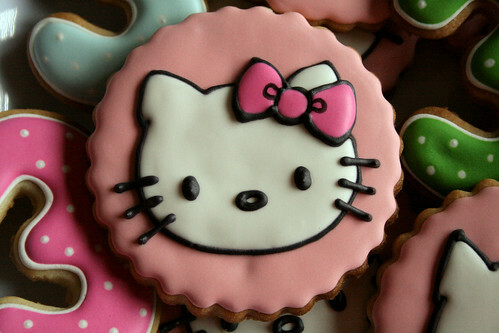 I sure enjoyed the opportunity to improve on my Hello Kitty cookies from this spring! « Spicy Beef & Broccoli Stirfry. What a wonderful opportunity for you. 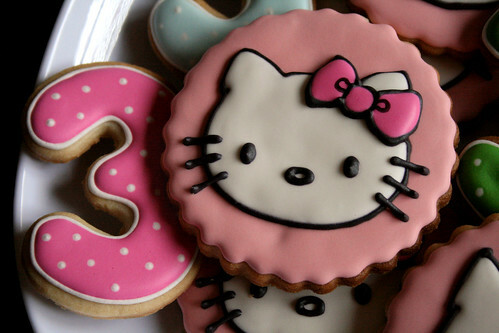 I love the cookies and the colours and I personally, don’t think that you need to improve your skills at all, with Hello Kitty cookies or any other for that matter. Sweet mother of all that is good and pure! Those cookies are amazing. A-MAZE-ING! 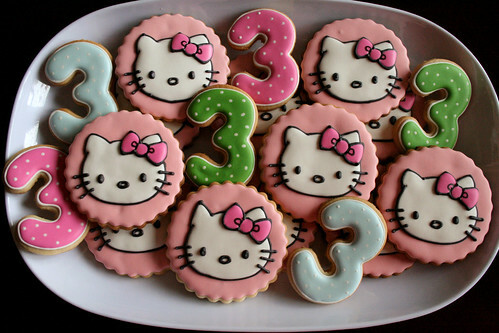 These cookies are fantastic. I love all of your extra details. And the colors, divine.